These are dealt with in separate sections below, followed by some tips that don’t fit in either. If you have students who are apparently unaware of the silence of their classmates while they talk and talk, whole-class speaking and groupwork are equally problematic. There are some types of groupwork which can help, however. Most of these are based around extended speaking, in which one student speaks for up to two minutes without any interruption. Extended speaking is a much neglected skill anyway, and it both gives dominating students the attention that they like and gives the students who are usually ignored a space in which to finally have their turn. There are four activities based on this concept below, followed by an idea that is more like a normal conversation but with students being careful about how much they speak. The simplest way of getting students to speak for an extended period is to give one student from each group a card telling them what they should speak about for one or two minutes. Their partners only have to listen to what they say and ask one or two questions (e.g. “You said… Do you also think that…”) after they finish. This is included in exams such as FCE, CAE, BULATS and IELTS, and these can be good sources of tasks to use and adapt. A variation on Mini-presentations above is to give students a topic to talk about and their partner a list of subtopics, e.g. “When you first met” and “What you have in common” for the topic “An old friend”. They listen silently, just ticking off the subtopics that their partner talks about. When they have run out of things to say, all the subtopics which haven’t been talked about are turned into questions to extend the topic. 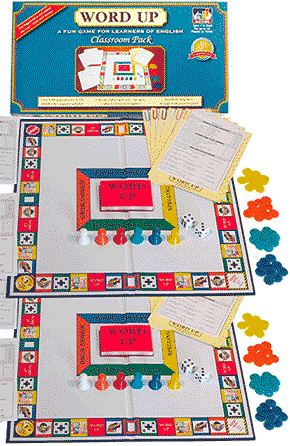 Extended speaking can also be turned into a board game. How long you speak about the topic decides how many squares you can move (in place of a dice). One good system is one square forward for each thirty seconds of speaking (perhaps after an estimate for pausing has been taken away), up to a maximum of six squares for three uninterrupted minutes. You can also play the game above with cards rather than a board. The first student takes a card and speaks as long as they can on the topic written on it. They are then allowed to take further cards for each period of thirty seconds that they spoke. Play then passes to the next person. When it comes to the first person’s turn again, they have the choice either to speak about the topic on one of the cards that they took before or to take another random card (which they then have no choice but to speak about). In Less is More, students are told that the person who speaks less will win the game. They should try to make their partner speak more by using techniques like asking questions (“Have you ever been there?”) and using tag questions (“…,don’t you?”) In Equal is More, they should work together to make sure they each speak for exactly fifty percent of the time (perhaps judged by a monitoring student in each group). This is exactly what students will be expected to achieve in Part Two of the Cambridge FCE and CAE speaking exams. One good tactic is to sometimes put dominating students together. It is perhaps too much to expect them to learn what the shoe being on the other foot feels like, and they may very well wind each other up, but it saves the other innocent students from their onslaught for a while. As with all setting up and changing of pairs, it is best if putting them together seems random rather than planned. Especially if you have a number of students that doesn’t fit in with the perfect groupings, e.g. thirteen students when you want them to work in pairs, another possibility is to group the dominant student with yourself. It is also possible to choose the groupings deliberately in order to make that possible. With both of the techniques above, it will of course be necessary to change to other groupings sooner or later. Constantly changing groups is also a good general tip for stopping any students from particularly suffering from proximity to their selfish classmate(s). If the dominating student also takes over whole-class activities and you can make the pairwork techniques above work, you might also think about having more pairwork and less whole-class work, for example doing brainstorming and grammar discovery tasks in groups. Other techniques which are usually used for naughty kids can also sometimes work with self-centred adults. Just mentioning the need for everyone to have an equal amount of speaking can sometimes be enough. 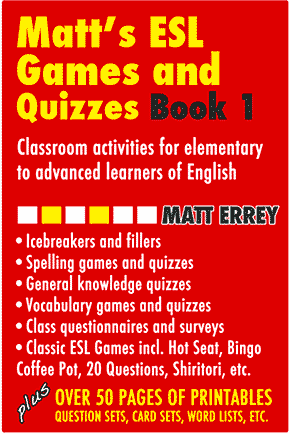 It is also possible to build the topic into classroom activities, e.g. “I can’t get a word in edgeways” in a lesson about giving advice, or discussion of turn-taking in a lesson on cultural differences. You could also draw up a class contract that specifically mentions respect for other people’s right to speak. Perhaps the best thing that can be done for most dominating students is to get them that one-to-one attention elsewhere. That could be by getting them a conversation exchange, or by offering them separate one-to-one classes.